Establish the transition area in your garage. Choose a space that’s reserved for hanging coats and taking off boots. Find a convenient spot to place packages, groceries or mail when you’re opening the door. Next, determine a need it now zone. This zone will provide quick and easy access to the things you use often. Items such as dog food and leash, soft drinks and other beverages, a place for recyclables are some examples. Identify elevation zones. High areas for seasonal or lightweight items such as exterior lights or ice chests. Reserve lower areas for the kids to store their sports equipment or outdoor toys. Zone for home and garden tools. Pick a place where you can accommodate tools that are long and thin such as rakes, brooms and shovels. Reserve another zone for items that are large but can be kept out of the way for months at a time. Examples are snow tires and camping equipment. Your hobbies and interest zones. A workbench is perfect if you like to garden or woodwork. Hooks and bins for car essentials. Cabinets can hold fishing gear or other hobby items. The possibilities are endless. Then call Hoosier Garages at (317) 440-6964 to schedule a free consultation. We can help you find a place for everything by creating custom storage spaces that are efficient, organized and exactly what you need. 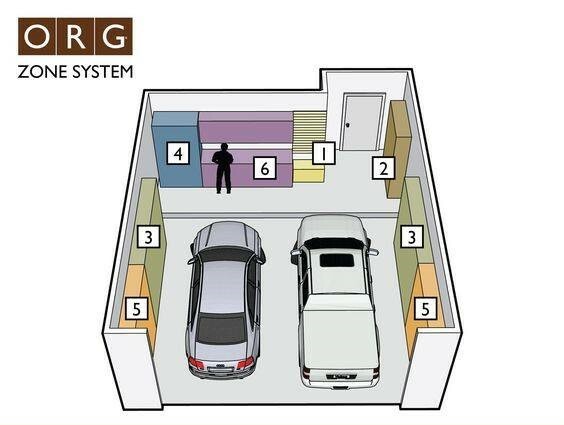 I love how you’ve managed to segment each part of the garage in your image into useful and functioning corners. I’ll try this idea and try to get custom garage storage that’ll make the garage more aesthetic. Thanks for the great idea!